The RHS Music program is planning to participate in Festival Disney during the winter of 2019. This is an optional trip for students. The field trip will be 5 days in length. The ensembles will participate in a national competition, work with renowned conductors of professional ensembles, perform and record parts of Disney film scores, and perform at iconic locations within Disney itself. We're sure we'll fit some fun in there too! While details are still being worked out, our primary focus at this time is fundraising. We don't want the cost to prohibit kids from going. We will be running a variety of fundraisers this year and next, and our travel company also provides payment plans. Our goal is to raise $75,000. One of the easiest things the community can do to support this trip is to eat at Tigers' Den on Thursday nights. A portion of the proceeds will be donated to the trip. 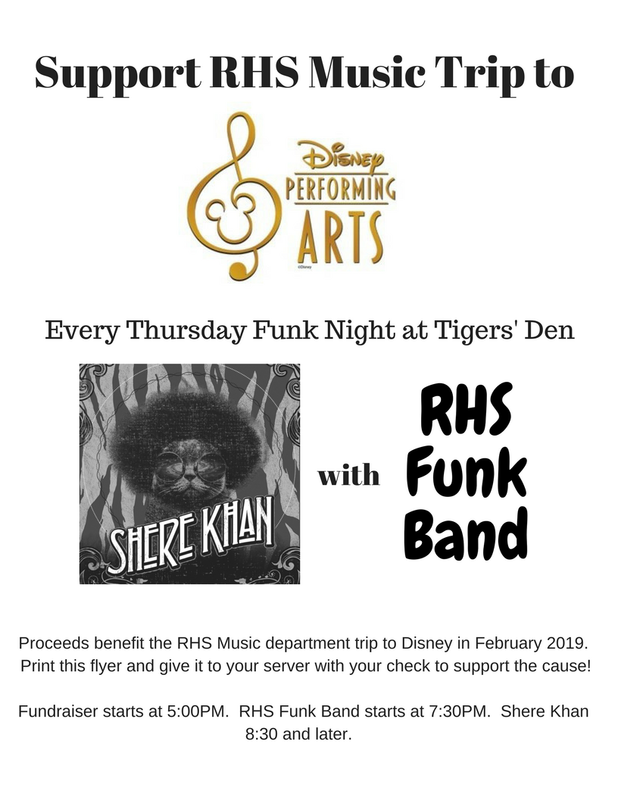 Music will be provided starting at 7:30PM by the RHS Funk Band and followed up with the house band, Shere Khan, at 8:30. Shere Khan features Mr. Mac along with some area private music teachers (Andrew Beals, Jamie Finegan, Dan Asher, Miles Livolsi) with students and former students often sitting in. With this event going on every Thursday and an average of $250 raised per week, we could knock off $12-15,000 off the total cost of the trip in a year's time. The fundraiser begins before the music at 5:00 PM and is good for the duration of the evening. All you have to do is print the below flyer and give it to the server. Either click the picture to download or click here for a PDF version. Proceeds from this year's FunkRaiser will be used to offset the cost of the trip. This event has real potential to knock a large chunk of the cost off all at once. The easiest way to help with the event is to attend, and to encourage neighbors, friends, and family to attend as well. FunkRaiser is most profitable when sponsors cover the cost of the event itself in exchange for advertising. If you or anyone you know may be willing to sponsor the event, please visit our FunkRaiser page to learn more information.